New Delhi, Dec 2: Ajinkya Rahane's performance will be vital to India's chances of a good show in South Africa but the Mumbaikar will "surely be disappointed" with the kind of dismissals he has had of late, said Indian team's batting coach Sanjay Bangar. For someone with best overseas average among the current crop of Indian players, Rahane is going through the most miserable patch in his six-year international career with modest returns of 7 runs from 4 innings in the current series. His discomfort against spinners has been palpable in the past one year as he has got out to all kinds of spinners -- off-break, leg-break, left-arm orthodox. One that was missing from his 'kitty of dismissals' was chinaman, which happened today when Lakshan Sandakan fooled him with a wrong 'un, getting him stumped. 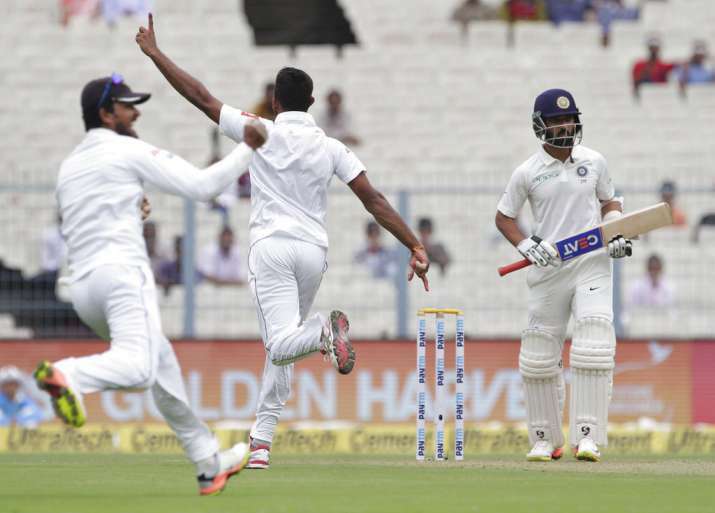 "He (Rahane) would be disappointed in the manner he got out. He is somebody who works hard on his game, like all players do. May be last match (trying to square cut off- spinner Dilruwan Perera) and this match (stumped off Sandakan), he erred in shot selection," Bangar said at the end of the first day's play of the third Test against Sri Lanka. Bangar is confident that Rahane will bounce back as he has the ability to do so. "I think that would be hurting him definitely but he is a quality player. And going forward, even his overseas record has been phenomenal. Yeah, he would be disappointed. He is a quality player and has the ability to bounce back quickly," Bangar exuded confidence. For Bangar, Rahane's calling card should be the runs that he has made in England, Australia, New Zealand and South Africa on previous tours. "He is one of the few players who has scored in every overseas country we have toured. That shows the quality he possesses. He is a quality player who has always performed when the chips are down for the team. He will be hurting with the kind of dismissals he has had but he is too good a player to not score runs for a long time." Bangar was asked about what kind of role he would play for someone like Rahane, who is not in the best of form, the coach spoke about getting rid of negative mindset. "I think a coach should be consistent in his interactions with a particular player. Every player wants to work on a certain aspect of his game and raise the bar. Irrespective of a player's form, our preparation is similar. As far as confidence is concerned, if any player is not in good form, it also depends on his attitude -- whether negative thoughts have crept in or not. "We have to ensure how one can counter and transform the negative thoughts into positive ones. These are things we discuss. The hunger is same in all players," Bangar explained. The former Railways captain said that while selecting the playing XI, the current form of a player is paramount. "The team management is very clear that the current form and the way in which the mindset of a player is going to be is paramount while picking the final XI.